A Whispered Wish: Project H.A.N.D.S. Photo Credit: RHF, Project H.A.N.D.S. Project H.A.N.D.S., which stands for Helping Angels National Donated Support, is organized through the Retirement Housing Foundation to provide services to the homeless and those in need. H.A.N.D.S. volunteers sew, knit, and crochet a variety of items such as mittens, hats, scarves, blankets, tote bags, dolls, stockings, and stuffed animals for families in need. 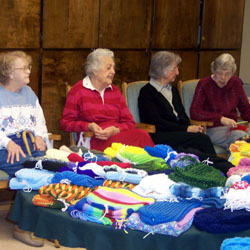 While families enjoy the gifts of yarn and fabric creations, senior citizens, churches, and community groups also benefit through bonding over these charitable arts and crafts. The Retirement Housing Foundation is a non-profit group in 24 states that provides housing and services to more than 16,000 senior citizens, including those who have economic problems or disabilities. RHF is celebrating their 50th Anniversary through the summer of 2012 in their 163 communities. To learn more about RHF, Project H.A.N.D.S., and their efforts, visit their website.